When I visited my old fraternity brother Bob Thomas in New York City, he said something like "Nick, every time I go to your web page it seems like you are doing everything except actually riding your bike". Well, no more. From here on you can hopefully look forward to all sorts of updates about me and passing miles. Tuesday morning Cindy dropped me off at the Yorktown Victory Monument. After we said our goodbyes and she drove away I found myself standing there alone thinking to myself "what am I doing here?" In another life I probably would have solved my problem by wandering over to my computer, but since that wasn't an option I started riding instead. I couldn't have asked for better weather to begin riding in. The sky was clear and the day was cool, and all the previous day's rainstorms had passed away. Today's ride was short, only around 25 miles. 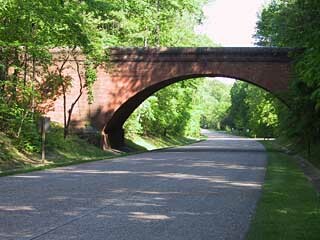 My ride began in Yorktown, the site of the final battle between the British and the Americans during the Revolutionary War. After ridging around some of the earthen ramparts from that battle, I headed down the Colonial Parkway towards Colonial Williamsburg. I stopped in Williamsburg only long enough to take a few snapshots, and then headed on to Jamestown. Jamestown was the site of the first English colony in the Americas, and I spent some time there looking at their exhibits and archeological digs. While I was there I met Lehman and Barb Holder from Oregon when they walked up to me and asked if I was riding the TransAmerica trail. It turned out that he was to have begun the trail the following day, but his riding partner had fallen and cracked two ribs recently and had to cancel their ride. Since Lehman and Barb had nonrefundable airline tickets to come to Yorktown, they decided to visit the area anyway. After I was done with Jamestown I headed over to a nearby campground and set up my tent for the night. It was all I could do to heat up a quick dinner before I passed out from exhaustion. Although the day's ride wasn't too bad, I was still wiped out from the process of getting down here and I ended up sleeping for 14 hours. Nick. It was great seeing you. I am glad you had good weather to start, because today (thursday) is looking crappy. Hang in there. 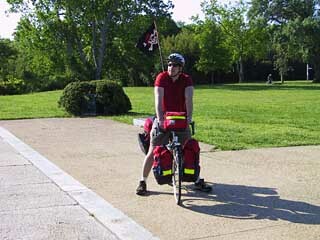 Is that the flag of piracy I see on the back of your bike? Depending on how this ride goes, you may wish to consider a career as a roving highwayman -- just keep riding, divesting wealthy Winnebago owners of their gold and jewels and tipping their wives and daughters a lusty wink. Or their husbands and sons. I mean, homosexuality is a distinguished pirate tradition after all, and if you decide to go that way I want you to know there's ABSOLUTELY NOTHING WRONG WITH THAT. We all love you and support you in your decisions. Plus my stepbrother's gay and can probably introduce you to some nice guys. I was 10 when I was last at Williamsburg. I remember how dorkey all the people looked until they shot the cannons and muskets at each other in a demonstration. I would love to go back now. Some day,,,,,,,SOME DAY. Do they make air bags for bikes? You can be sure I'll be reading your journal. Nick, I took the liberty of retasking several CIA/NSA/NASA satellites in order to more carefully observe your journey (since your updates are infrequent). Better not be lying about those ramparts. I am so proud of you. You made it through the first day of riding. It's all downhill from here (you wish!). Enjoy yourself! I know I am enjoying the pictures and the updates.